This week began with the revelation that "the Pentagon is considering a plan that allows the U.S. military to conduct airstrikes on ISIS in the Philippines." 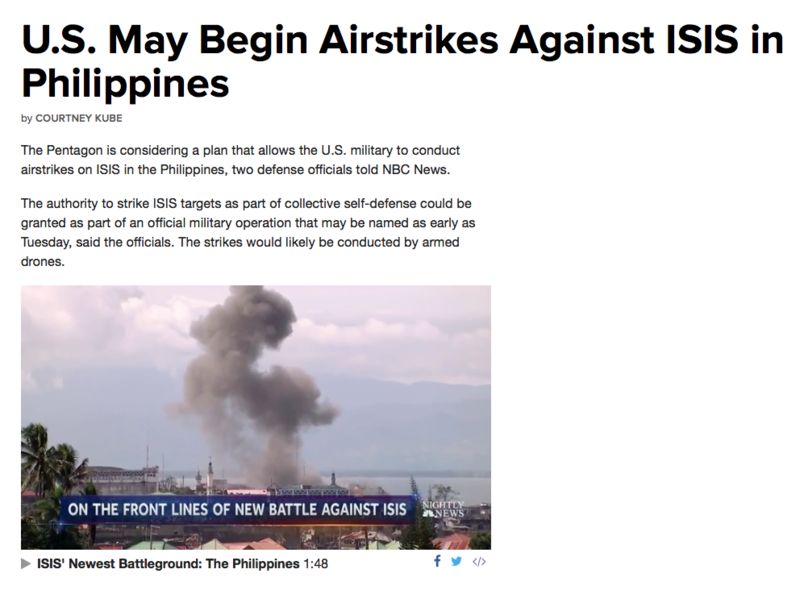 If approved, the U.S. military would be able to conduct strikes against ISIS targets in the Philippines that could be a threat to allies in the region, which would include the Philippine forces battling ISIS on the ground in the country's southern islands. 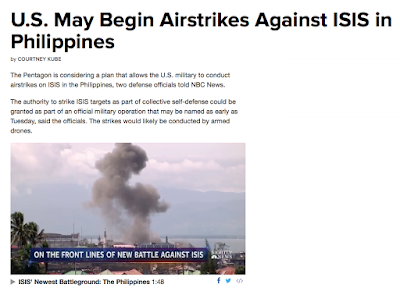 But Pentagon spokesperson Lt. Col. Christopher B. Logan told NBC News Tuesday that "The Philippines have not requested nor is the U.S. planning drone strikes in the Philippines." Another U.S. official said that the authorization for collective self-defense was more about intelligence sharing than offensive U.S. strikes. “Collective self-defense doesn’t necessarily mean airstrikes,” the official said. For example, if the U.S. sees a threat to the Philippine military, it could provide that intelligence to them to protect themselves. The official would not rule out that the U.S. would be able to launch the strike themselves. The official also would not say whether the additional drones the U.S. is considering sending would be armed or not. Great. Just what the USA needs. Another unconstitutional, undeclared war against an undefined enemy: terrorism. Of course the Pentagon won't confirm or deny or rule out anything. Does any journalist think the Pentagon will be revealing what plans it has coming? The USA continues, as it has for many years now, to provide military aid to the Philippines. This includes providing equipment and sharing intelligence. Despite Duterte's assertions claiming that he had no idea the Americans were providing any assistance in Marawi he seems to have no problem with allowing it to continue even to go so far as to laughably call himself the "humble friend" of U.S. Secretary of State Rex Tillerson. Philippine President Rodrigo Duterte called himself a "humble friend" of the United States on Monday, taking a break from his notorious hostility towards Washington to grant a warm reception to visiting U.S. Secretary of State Rex Tillerson. Truly one can say of Duterte that he has prepared a face for every face he meets. To the Filipinos he is anti-US and he demands they return the Balangiga Bells and get out of the country. 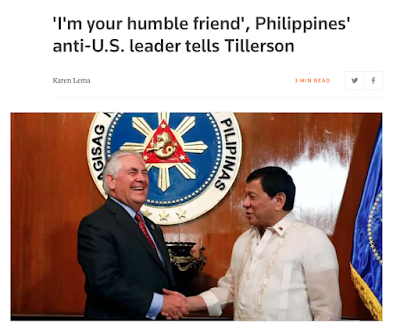 But when he actually meets with the US Secretary of State he is now a "humble friend." What's this about "the ever nagging problem of the South China Sea?" China will not be pleased to hear that assessment. Aren't the Philippines planning to jointly drill for oil with China in the South China Sea? The Philippine government has denied that the US will begin airstrikes against terrorists. 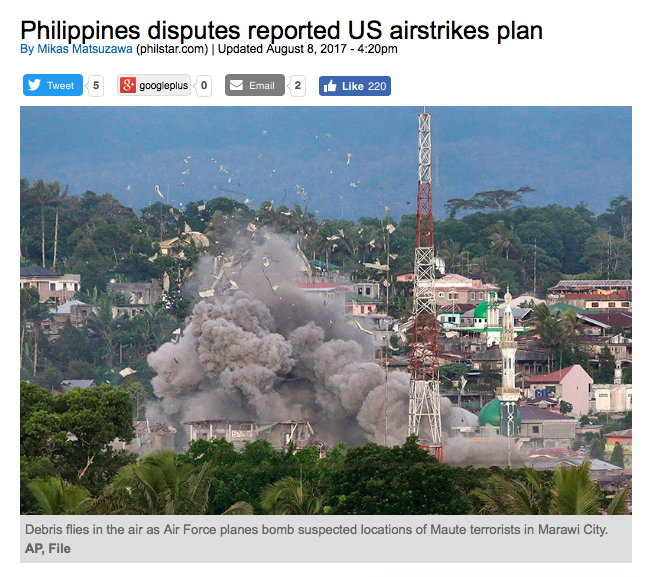 NBC news reported that two US defense officials divulged plans of the Pentagon to have American troops granted the authority to strike, likely through armed drones, ISIS-inspired militants in Marawi as part of an official military operation. Año said, however, that the Mutual Defense Treaty with the United States does not allow such a measure. "Direct military actions are only allowed during actual foreign invasion by another state actor. Hence, such a proposition has to undergo a process and an agreement must be reached that should have the approval of both the highest officials of our nations," the DND said Tuesday in a statement. Now isn't that something. 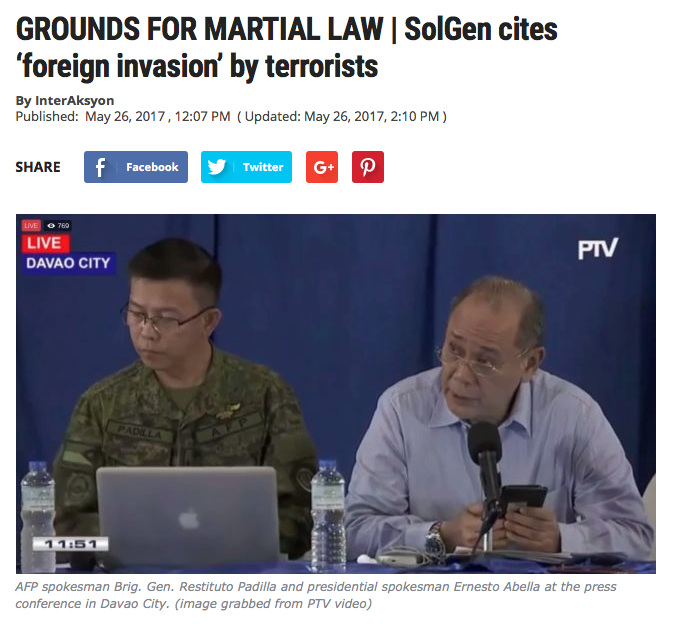 Here we have an admission that what is happening in Marawi is not an actual foreign invasion. But foreign invasion is one of the excuses the Duterte administration used to justify marital law. 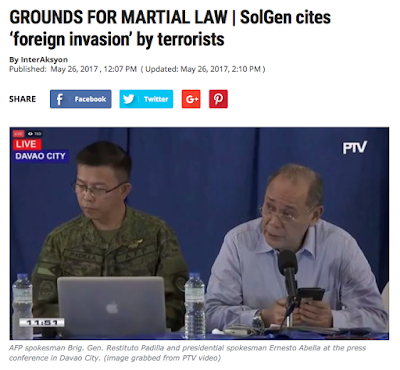 Solicitor General Jose Calida on Friday cited an “invasion by foreign terrorists” of Mindanao as among the major justifications for President Rodrigo Duterte’s declaration of martial law over the whole southern island. “What’s happening in Mindanao is no longer a rebellion of Filipino citizens” but “has transmogrified into an invasion by foreign terrorists who heeded the clarion call of the ISIS to go to the Philippines if they find difficulty in going to Iraq or Syria,” Calida said. So is it a foreign invasion or not? Can ISIS be declared a state actor or not? Apparently it's yes and no with these guys. Yes it's a foreign invasion but no its not an actual foreign invasion by another state actor. What is the difference? How can there be a legitimate foreign invasion unless another state actor is involved? Do all the thousands of foreigners living in the Philippines constitute a foreign invasion? Will the media pick up on this contradiction between what Año is saying now and what Calida said then? Highly doubtful. Investigative journalism does not seem to be a specialty or concern within the Philippines media. Ultimately the Supreme Court ruled in favour of martial law on grounds of rebellion and not foreign invasion. But the damage has been done. Foreign invasion is now a part of the narrative pushed not only by the Duterte administration but also by its staunch defenders such as Antonio P. Contreras. 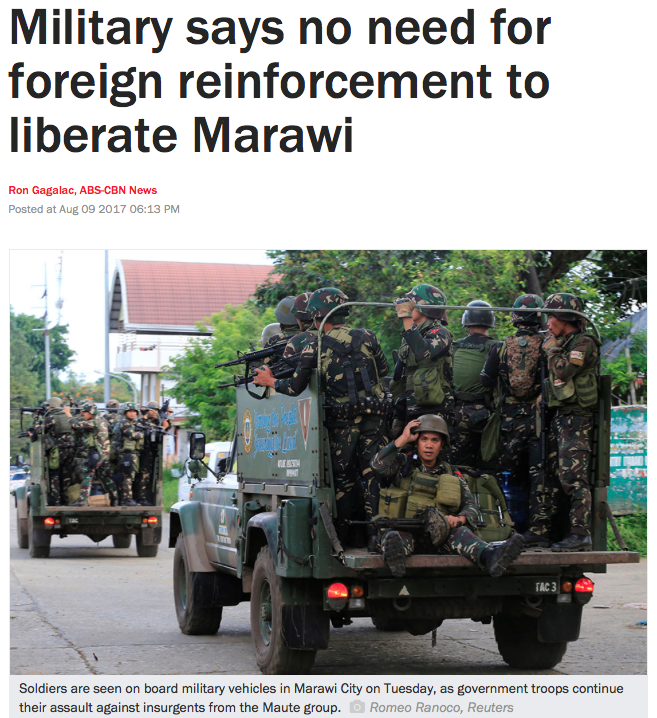 With well-documented intelligence reports confirming that Isnilon Hapilon was the anointed emir tasked to turn Lanao into a wilayat, or a province of the Daesh or the Islamic State, what was also established was the onset of an invasion by a foreign terrorist force implanting itself in our territory. Thus, what is now going on in Marawi is no longer just rebellion. It has also already acquired the character of an invasion. 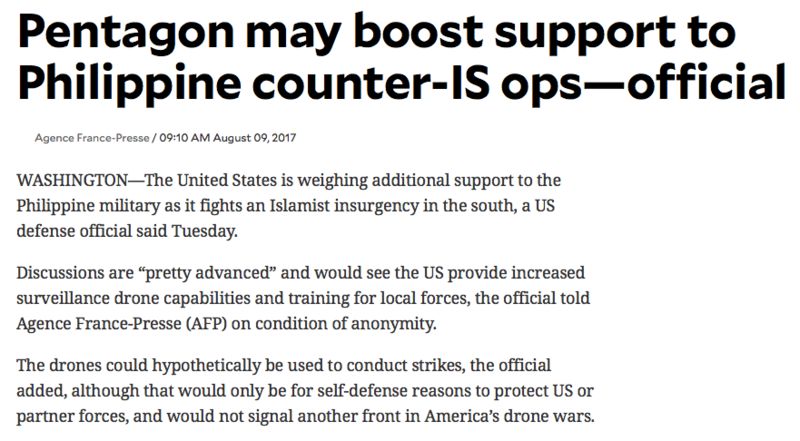 Whether or not the US will expand it's drone war to the Philippines they will definitely continue to provide support to the AFP. Russia has still not provided any assistance whatsoever. But no matter because with or without aid or troops from foreign nations the AFP can do it. They don't need the USA to meddle in their affairs. By all means continue to send equipment but let the AFP handle the fighting. 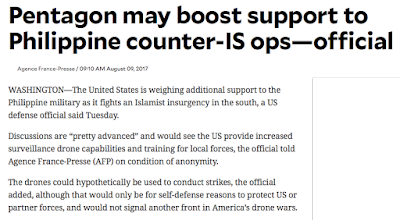 They can do the airstrikes. They can patrol the waters. They can recover enemy munitions and vehicles. And good for the AFP. They keep fighting the good fight and now it is the last days of battle which lie before them. 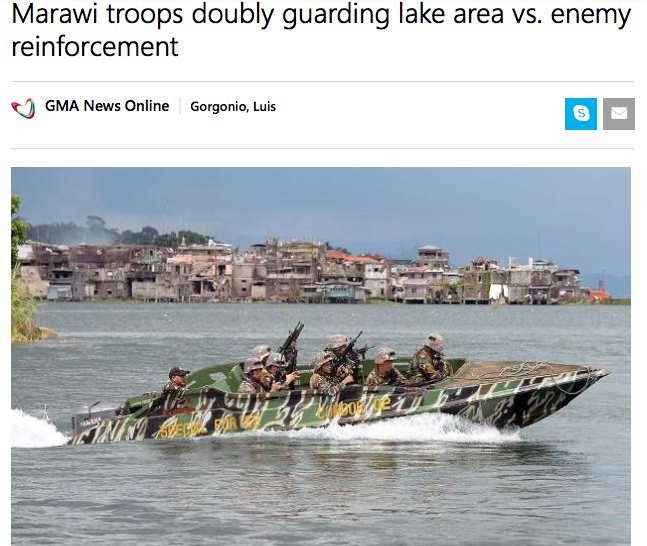 The battle for Marawi has entered the final, critcal phase, according to the military. Capt. Jo-Ann Petinglay, spokesperson for the Western Mindanao Command (Westmincom), said eight soldiers have been killed since Aug. 2 as the final phase of military operations to flush out Maute militants began. As the AFP inch closer and closer to victory it could be that they will face their toughest challenge yet: hostages strapped with IEDs. 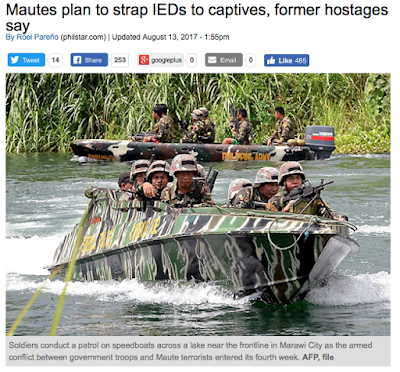 According to Marjalino, the Maute plan to strap the IEDs to their hostages if government forces manage to encircle their positions. 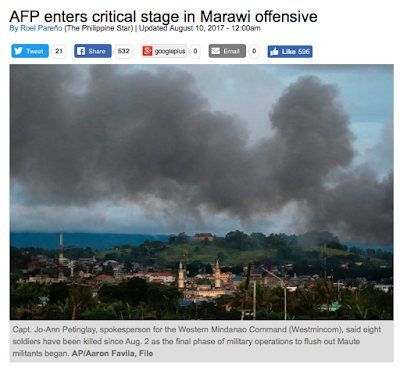 With victory fast closing in plans are being laid to rebuild Marawi. Even now in the midst of the war classes at Mindanao State University - Marawi are set to resume. 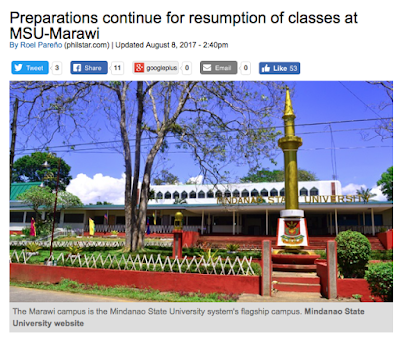 “The Mindanao State University is the symbol and life of Marawi City. This is the bastion of knowledge and we will have to open classes the soonest," Petinglay quoted Galvez as saying. 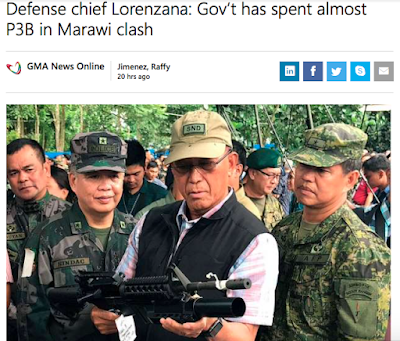 "It is really a challenge in these trying times, in the thick of the battle in the eastern side of Marawi, it is a challenge to open the MSU, especially that it is one of the targets of the terrorists," he said. “But we have to test the waters and come up with means to bring back the life of Marawi through the opening of this revered institution,” Galvez said. “Education is the best antidote to terrorism. If we suspend classes and disallow children from going to school, then terrorism has already won," Galvez said. Forget about the danger opening the school poses since it is a target. Think about the symbolism! Yes the symbolism. That seems to be so much more important than actual safety. Residents of Marawi are still living in refugee camps, the city is still under siege, and these fools think opening the University is so important because of the symbolism. "Education is the best antidote to terrorism!?" Hardly! 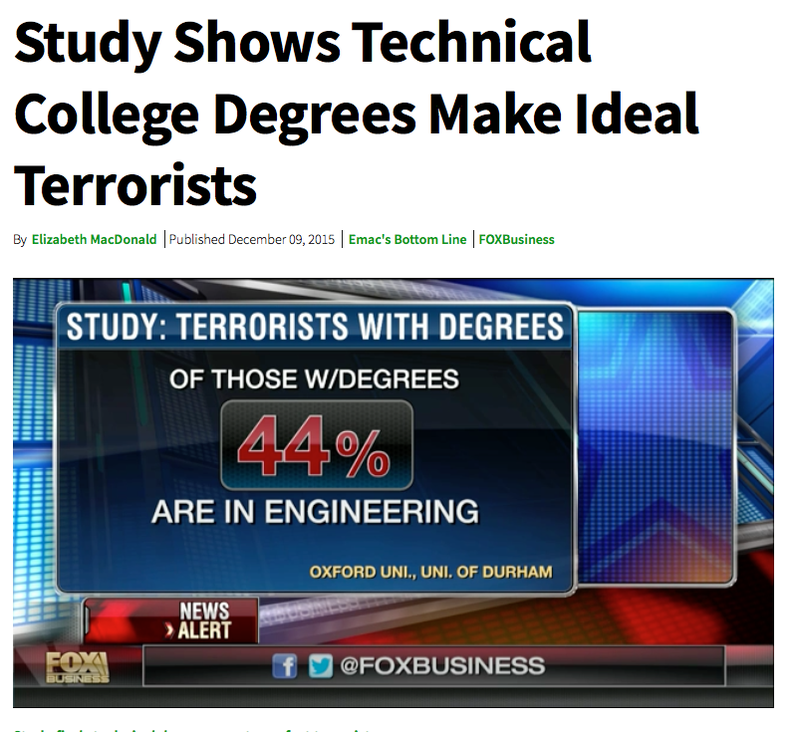 New analysis from the British Council, based on British intelligence dossiers and academic research, finds that college degrees in technical areas like engineering create the perfect Islamic terrorist, “intelligent and curious, but unquestioning of authority” since they require “precisely the passive acceptance of right and wrong, and the faithful reproduction of knowledge learned by rote that jihadism seems also to require,” versus the critical examination and debate liberal arts degrees that could stop the creation of future jihadis. Analysis from Oxford University also shows a large number of Islamic terrorists are highly educated professionals, and do not come from the ranks of the uneducated poor, as analysts and Administration officials, including Secretary of State John Kerry, have asserted. “Many Islamic radicals are not economically dispossessed, are often better educated than their peers, and quite a few went to university,” Oxford says. 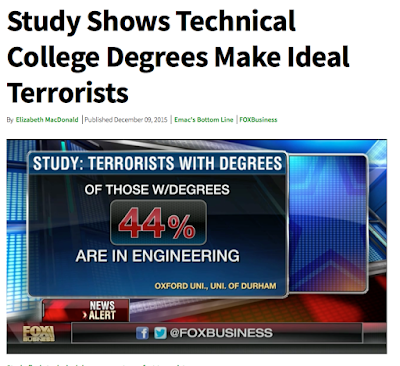 Terrorist leaders recruit from the educated ranks of their local populations, recruits who had gravitated towards technical subjects, like engineering degrees, versus religious or political courses, according to the British Council, Oxford University and the University of Durham in the U.K.
A university education in the Philippines is not worth much and now that state universities will be free it will be worth nothing. Speaking of which Duterte was warned by his economic advisors to not sign the bill granting free tuition to state universities into law because there was no way to fund it. 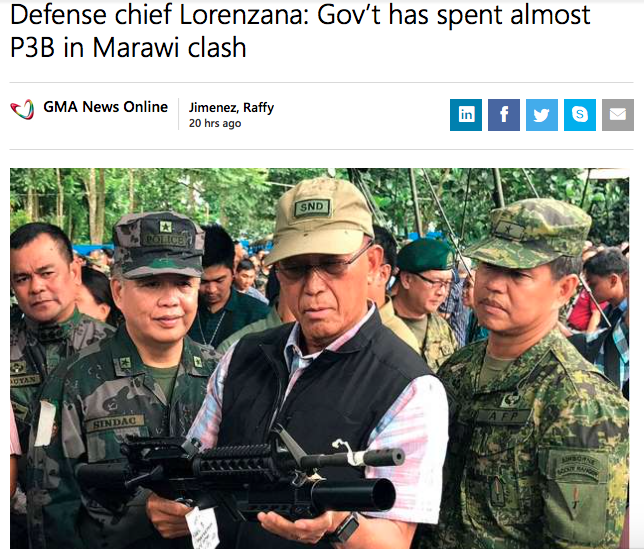 Now they have to find a way to fund it which means more strain on the budget and possibly funds that could be used to rebuild Marawi will necessarily be diverted. Billions have already been spent on the battle alone. Already the estimated costs of rebuilding Marawi are at P20B. And that is sight unseen. Now a committee has been formed to calculate the actual costs of rebuilding Marawi. 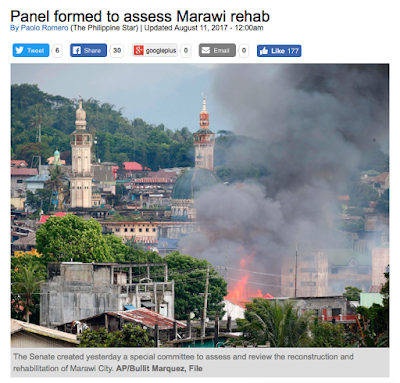 “The special committee will assess and investigate the extent of damage to property, infrastructure and facilities, such as roads, bridges, schools, hospitals, building and other structures in Marawi,” the resolution read. “It will also study the estimated cost of construction and rehabilitation of the damaged properties, infrastructure and facilities or other matters that may be necessary for the rehabilitation of Marawi City,” it added. 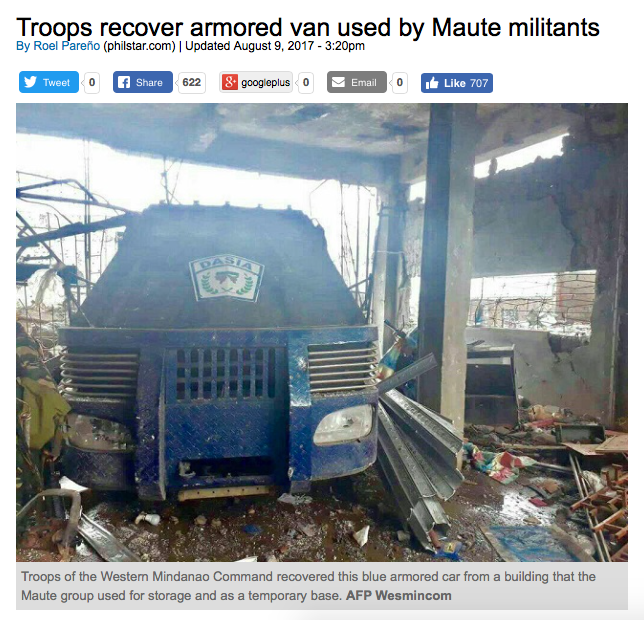 And to think all this destruction could have been averted if the government had not turned a blind eye to all the weapons pouring into Marawi. Speaking for the first time in public after a 5-day hiatus, Duterte, during his visit to troops at the 4th Infantry Division Command Post in Butuan City, said the government “took for granted” the entry of firearms into Marawi due to hopes of a peace deal with communist rebels. 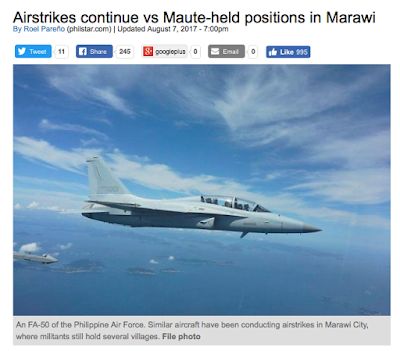 The government knew about the weapons coming into Marawi and turned a blind eye thereby allowing this fiasco to occur. When will the media or the Senate create a special committee to investigate that?